One Sunday morning not too long ago, my husband and I decided to go try out Buns ‘n Roses Café and Flower Shop in Marfa. I was the lucky winner of a gift certificate for Buns N’ Roses, and so we decided to use the certificate before I put it someplace special enough to never be found before the expiration date. Unless you know what you’re looking for or have your GPS barking driving commands at you, you might drive past Buns N’ Roses and have to turn around. 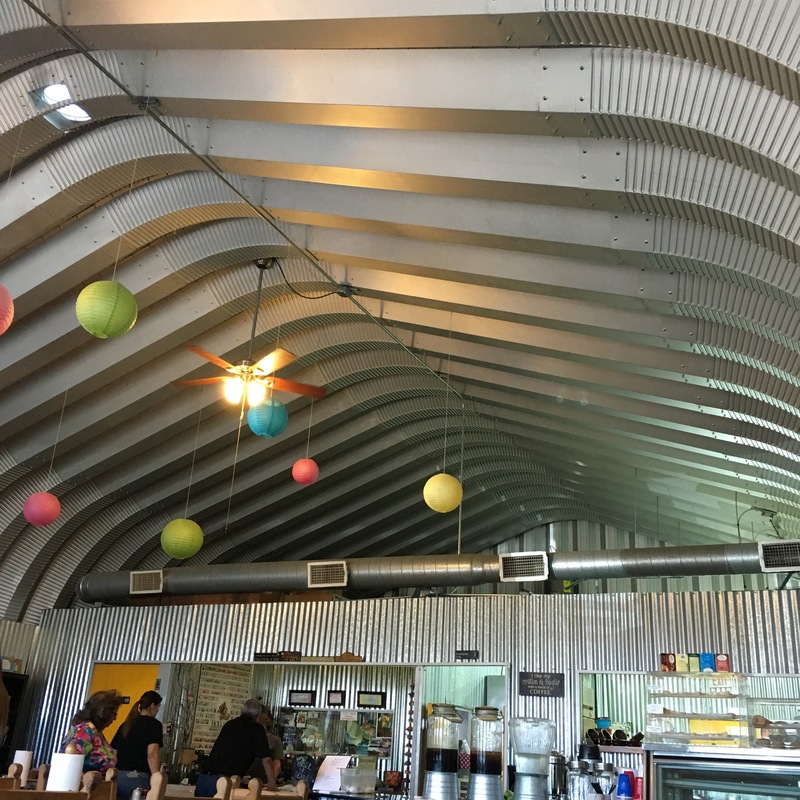 Buns N’ Roses is located inside a metal Quonset hut behind a fence and across the highway from the cemetery, barely on the outskirts of town headed toward Presidio. The restaurant is owned by daughter-mother team of Janika Gilly and Etta Sproul-Parrott, built by Janika, Etta (Debbie), William (Bird) Parrott, and Jerik Gilly. Bird visited with us while we waited for our food and gave us some history on how they built the big steel structure that was surprisingly comfortable in the mid-morning Marfa heat. They opened in November 2012. While they serve breakfast and lunch all day, they are also a gift and floral shop, hence the name… Buns N’ Roses. Debbie’s daughter Janika Gilly whips up breakfast items in the kitchen, ranging from breakfast sandwiches on bagels or English muffins, breakfast burritos, waffles, omelets, oatmeal and bacon with eggs and more. 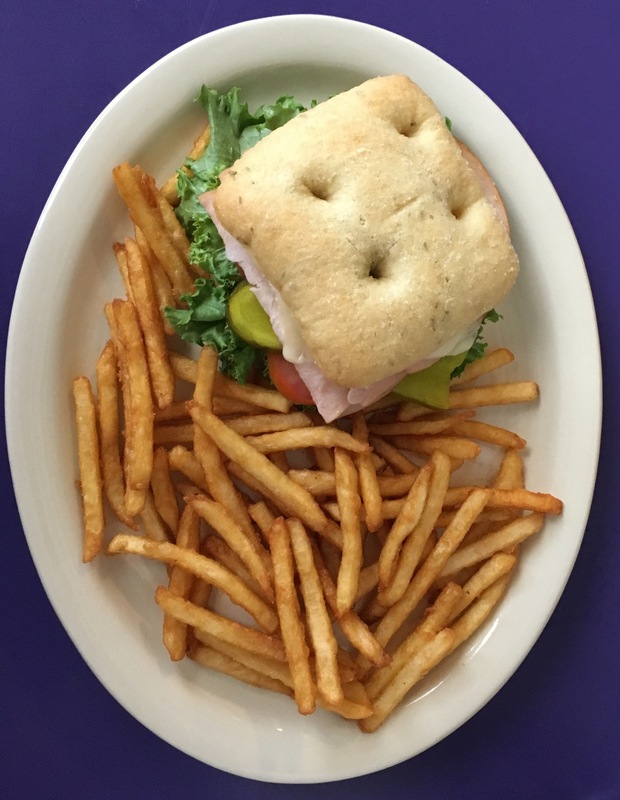 The large lunch menu offers an impressive variety of sandwiches, burgers, quesadillas, nachos and salads. I love breakfast, especially when someone else is doing the cooking. The breakfast menu is expansive, and doing my research on Yelp before we went, I figured I’d be eating a breakfast burrito or omelet, and some of the cheesy grits that got such high praise on the internet. Maybe a homemade donut if I had room. Once we got there and took a look at the entire menu, I decided I wanted a sandwich. So much for breakfast cooked by someone else. I ordered the Turkey Cuban, and my husband ordered the Club Sandwich. 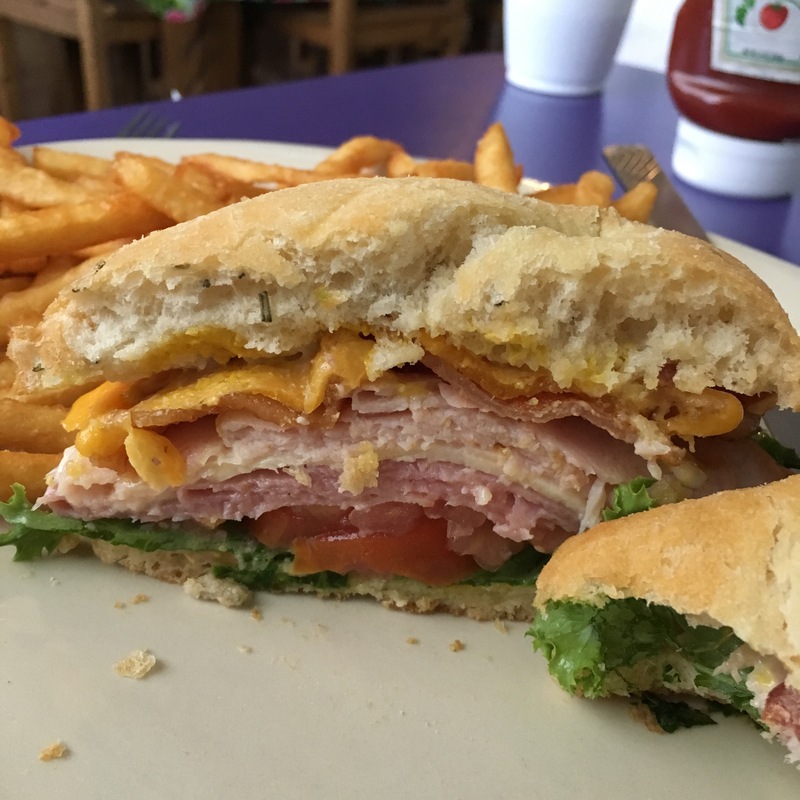 He often orders a Club if it’s on the menu, and it seems every restaurant has its own version of the old standard that commonly resembles a BLT combined with a turkey sandwich. His sandwich was served on soft Focaccia, and it was perfect. We both got the beer battered French fries, although I think we could’ve shared an order. Everything was so tasty and filling that I couldn’t have eaten even a teeny bite of a donut, no matter how wonderful the internet reviewers said they were. Above is my Turkey Cuban. Below is his Club. The focaccia bread was the perfect touch. Buns N’ Roses also provides a variety of baked goods as well as special-order cakes, pies, cookies and bread. They are open Thursday through Sunday from 7 a.m. to 2 p.m. and are located at 1613 West San Antonio in Marfa and can be found on Facebook. In a large mixer bowl, combine yeast and 1/2 cup of water not hotter than 110 degrees. Let sit for about 10 minutes, until yeast becomes foamy. Add remaining 2 cups water and the oil. Add flour, about 1 cup at a time, mixing well after each addition. Add salt and knead until dough has a smooth texture. Place dough in lightly oiled bowl and let rise until doubled, about 1 1/2 hours. Shape dough into 9 by 11-inch rectangular baking dish. Cover with a towel and let rise about 25 to 30 minutes. Dimple the dough with your fingertips (with all four fingers of both hands, make indentations all over the dough). Cover and let rise again until doubled, about 1 1/2 hours. Preheat oven to 400 degrees. Brush the dough with olive oil. Then sprinkle with garlic, onion, pepper and kosher salt. Bake for 30 to 40 minutes, or until golden brown. Remove from oven and invert so the bottom doesn’t get soggy. Cut into 8 squares and use as sandwich buns. Spread about 1-1/2 teaspoons of mayo on one side of each piece of toast. Place turkey on one piece of toast. Fold or tear one lettuce leaf to fit over the turkey. Place another piece of toast, mayo-side up, on top of the turkey/lettuce. Break up cooked bacon to fit on top of toast, then tear/fold lettuce to fit on top of bacon. Arrange the tomato slices on top of the lettuce. Top with a piece of toast, mayo-side down. Stick a toothpick in the corners of the sandwich so that when you cut it into four triangular pieces with a serrated knife, the toothpicks are in the center of each quarter. Option: forego the toasted bread and use a Focaccia bun you just baked to hold your meat and veggies together. Building was built by Janika, Etta (Debbie), William (Bird) Parrott, and Jerik Gilly. So sorry about that! I fixed it here on my personal blog but it will still be printed in the paper the way I submitted it 😦 Dang it. In my defense, I’ve never been a reporter, just a writer and cook. Thank you!!! No worries. Thank you for the article – it is great! We appreciate all that support our business. Again Thank you! Previous Previous post: Organic farming in the mountains of West Texas is flourishing!